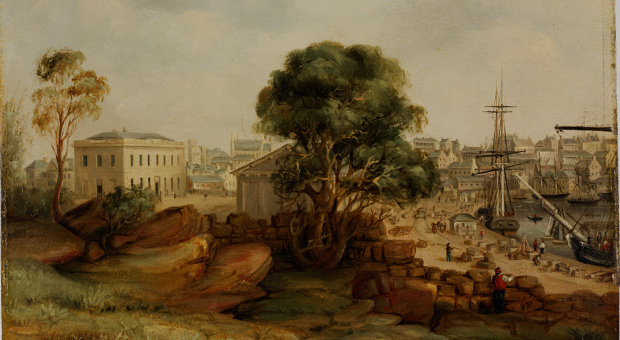 For our Expert Q&A on Thursday, August 25 we had Lisa Murray, City of Sydney historian and Chair of The Dictionary of Sydney join us to discuss Sydney’s history and genealogy resources. Thanks again to Lisa for giving us all the benefit of her time and expertise. Our Expert Q&A with Lisa Murray starts in 15 minutes at 8:30pm AEST. Join us with your questions on Sydney’s history and genealogy resources at the City of Sydney and The Dictionary of Sydney. Please ask your questions in a comment below, and Lisa will answer in a following comment. Comment: IHM: Welcome everyone, thanks for joining us. Please welcome Lisa to tonight’s Q&A! A. Lisa: Hi everybody! Great to be here. Q. From Christine: Hi Lisa! Could you please let me know where I could view images of what Woolloomooloo looked like between 1900 and 1912 and where could I read or learn about what life was like for the people who lived there? Many Thanks, Christine. A. Lisa: Good question Christine. One of the best places to start looking for info about Woolloomooloo is on the Dictionary of Sydney. http://dictionaryofsydney.org/place/woolloomooloo Here you will find images and an article about the history of the suburb written by Shirley Fitzgerald. A. Christine: That’s awesome, thanks Lisa. Q. From Karen: Hi Lisa, I am trying to find where Catherine Nicholls was buried in Feb. 1864 nee Hanlan per Elizabeth II. He death cert just states Sydney. Her infant daughter was buried in 1834 in the Catholic section of Devonshire St.
A. Lisa: Hi Karen, 1864 is a bit of a cross over period. 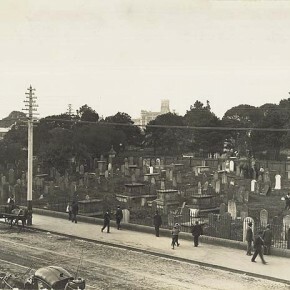 Devonshire Street Cemetery was almost closed (only those with vaults could be buried after 1865) and Rookwood Necropolis opened in 1867. Double check Devonshire Street listings (Sainty & Johnson). They also have a list at the back of all the active cemeteries at particular times, so you can target specific cemeteries. I think there was a small Catholic Cemetery that was later cleared in Balmain (separate to the Balmain Cemetery). A. IHM: Here’s the link to the State Records NSW Archives In Brief 69 – Cemetery records :: http://ow.ly/nWX96 – with details for Devonshire St.
A. Lisa: It kind of depends where they might have been residing / where they died as to where they were buried. There were also Catholic cemeteries active out around the Hawkesbury. 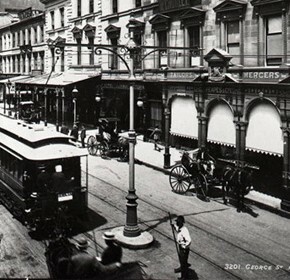 A. Karen: She lived at Market St Sydney. Q. From Yvette: Hi Lisa, where were the first ‘Scottish suburbs’? Earlwood or Marrickville? Ta. A. Lisa: There’s a bit of info in the Dictionary of Sydney. 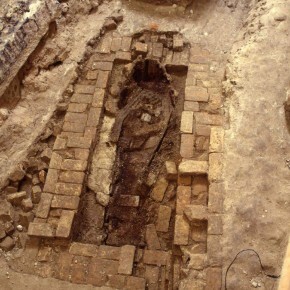 Here’s a great image: http://dictionaryofsydney.org/test/image/54136 and then this also links across to mentions in articles about Marrickville and about Bricks (right hand side of webpage). A. Lisa: Also have a look at Chrys Meader’s book “Marrickville: Rural Outpost to Inner City”. He was producing over 100,000 dry pressed bricks per week in 1886 (p.147). Q (b): Lesley: That’s brilliant – do you know if there are any historical records (employment etc) for companies like Daley’s? A. Lesley: Will try to locate a copy of the book to have a read – thanks for the info, that is really helpful. A. Lisa: Noel Butlin Archives are a good archive to remember to check for business records. Also in the Marrickville book mentioned earlier, it says that Daley’s employed approx 60 workers. The property was sole to Marrickville Council by 1923 because the clay had been worked out. So it would be worth checking Marrickville Council’s archives and local studies collection for further information. The Council should have some records about the sale. Q. From Leane: I’m wondering if there are many photos or maps from 1858 of Mcleay St, Wooloomollo, my 2nd g grandfather arrived on the Peter Maxwell and was sponsored by his sister and she lived there. Would be great to get an idea what it was like, or a picture of the ship. A. Lisa: And also have a look at the Historical Atlas of Sydney. http://www.photosau.com.au/CoSMaps/scripts/home.asp which is published by the City of Sydney Archives. It has lots of great maps. A. Leane: Wow that’s interesting, I’m guessing it changed its borders/name from what was on his arrival record. Thankyou for your help. Q. From Christine: Hi again Lisa, are you able to advise where I could look for prison records for 1910, as an ancestor was convicted in the Central Police Court for fraud, and didn’t have the money to pay the fine? Thank you. A. Lisa: Hi Christine, State Records NSW is the place to go for prison records. Also don’t forget to check TROVE for any newspaper articles or mentions. Q (b): Christine: Thanks Lisa and Inside History – could you give me a clue as where he may have been taken? He was convicted in the Central Police Court by Magistrate Mr Maitland for Fraud , so he wasn’t a hardened criminal and he lived in Woolloomooloo. A. Lesley: Oh thanks for the link to the inmates… just found out that there are 2 pics of my 3x great grandfather available, ordering them now! A. Christine: Excellent! Thanks very much ladies, much appreciated – I live in Victoria, so I am unfamiliar with Sydney and surrounds. Q. From Janelle: I have husband and wife ancestors, Thomas and Ellen Dixon dying in 1847 and 1842, and their funerals were held at St Lawrence Church, Sydney. Their names don’t appear on the Old Sydney Burial Ground index, so where might they be buried seeing as St Lawrence doesn’t have a cemetery? Thanks. A. Janelle: Great! Thanks Lisa. Q (b): Janelle: Also (being greedy asking 2 Qs lol), has there been anything published on the bathing houses of Wooloomooloo Bay? One of my ancestors, Esther Spencer/Bigg, ran one of them. A. Lisa: I’ve done a bit of work on early baths and will post something else tomorrow when I’m back in the office where my research files are! Q. From Lesley: New question for you… Any suggestions on where I might find info about someone who played professionally for Canterbury Bankstown in the 1940s? A. Lisa: Thanks to my partner Mark for the league tips and Inside History for posting these links – I’m a Manly Sea-Eagles fan. A. Lesley: hahaha!! Well my thanks to Mark as well because I just found my great uncle on the list! You have been amazing tonight, thank you so much! A. Denise: Lesley I don’t think they were professional players in the 1940 and at that time by we’re nicknamed The Country Bumpkins before changing to The Berries. A. IHM: lol, the Country Bumpkins – we like it! Q. From Sue: Hi Lisa I would like to find out my information about the institution on Cockatoo island from around the late 1890s as my great grandmother was sent there when she was 14. Could you please point me in the right direction… Thanks. A. Lisa: I would be checking with State Records NSW. A. Lisa: It was a children’s reformatory – girls were sent there. Boys were on the Vernon, anchored offshore and girls were on the shore. It was also operating as a shipyard at the same time! Q (b): Sue: Is the reformatory still there? Q. From Rebel: Hi Lisa! I’ve got a question about O’Connell St. My 3x great grandfather (Nicholas Delaney) was ‘granted the lease of 2 O’Connell St’ on 5 November 1813. Would I be right to assume this was the one that runs between Bent St and Hunter St? Or were there others at that time? Would you know how I can find out more? I’m not in Australia so that could limit my researches. A. Lisa: With that date of 1813 I’d be almost certain it would be O’Connell Street between Bent & Hunter. Have a look at the City Section Survey Plans 1833 in the Historical Atlas of Sydney http://www.photosau.com.au/CoSMaps/scripts/home.aspas these list many of the early grantees. A. Rebel: Thanks Lisa! That’s brilliant!